Hollywood filmmaker Duncan Jones, who sparked heated reaction on Twitter (@manmademoon) this week by saying his young children were “rarely fun” and “exhausting, frustrating & life-destabilizing” — wasn’t entirely wrong. On some level, I appreciate his honesty in admitting this dark thought he’s been wrestling with. But his perspective on parenting, which is shared by millions of others, needs to be discussed – both for his sake and for the sake of countless other children, lest they are raised by a generation of parents who view them only as an inconvenient burden with few redeeming qualities that merely serve to disrupt our comfortable lives and who hopefully, if we’re lucky, grow up to be tolerable adults who we like to hang out with. First, let’s talk about what Duncan got right. Parenting is exhausting and at times, frustrating. It’s HARD. Amen to all of that. I have four children (13,9,7,3) so I understand the challenges all too well. Take the photo for this story, for example. 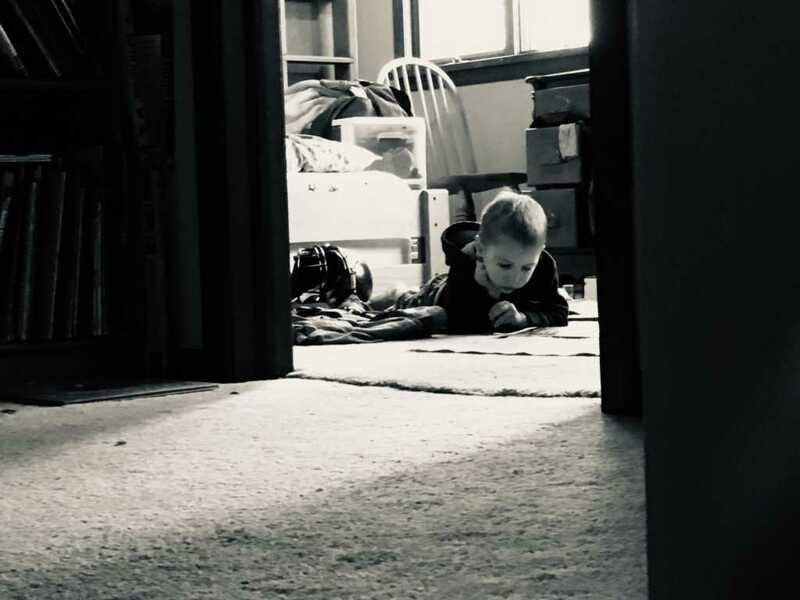 That’s my 3-year-old son, and while it looks like an ordinary picture of a cute kid playing, it’s basically the Archduke Ferdinand moment of our home. See, a giant toy war has been brewing lately between him and my two older boys. We’re always trying to work on issues of the heart, and lately, their hearts are a little too attached to their toys. This one’s mine, he can’t have it, he’s going to break it, he took it, and on and on the vicious cycle goes. More times than not, trying to protect their toys from the little destructor who doesn’t know how to play with them properly leads to an argument which leads to a fight which leads to someone in tears or screaming. That is a recipe for disaster. If you don’t look for the joy now, if you continue to rationalize and justify this dark string of thoughts, you will only resent your children more and more as they grow older. You will not suddenly flip a switch and find joy in them. It’s all about perspective, and parenting is a job, not a fun hobby. We don’t have children for our own amusement, or to be our buddies, or for any other superficial reason. We have children because they are a blessing from God, and it’s a beautiful responsibility to be entrusted with a new life, and be in charge of molding and shaping them and training them up in the way they should go. God has given us a clear purpose in having and raising children, and when He is removed from the picture so too is the purpose removed. All that remains are little, breathing pleasure obstacles that inconvenience us at every turn. No wonder secular culture is so quick to discard unborn babies for reasons of convenience, or unable to find purpose and joy in children – they’ve chosen to ignore where kids come from and why we have them. I feel sorry for Duncan that he has apparently lost the awe that comes with seeing your own child for the very first time. I pray he gets it back or finds it if he never experienced it in the first place. And I pray he finds more purpose in parenting than simply ‘having fun’ with his children and that God opens his eyes to the great calling he’s been given as a father. You don’t need to be a Christian to know that children thrive on and desperately need love in order to flourish. And love doesn’t happen only when it’s convenient. Love is patient. Love is selfless. Love is kind. Love is sacrificial. Love is intentional. It’s not just a feeling – it’s something we actually do. We have to work at it! And when we work at loving our children, when we work to teach them and train them and mold them at every opportunity we get, we not only grow as individuals – we start to experience joy. Back to the picture I mentioned earlier – the one at the top of this article. I explained the context – how my older boys have been territorial over their toys and having a big heart issue there. Anytime our little guy walked into their room, it was instant combat and ushering him out as quickly as possible. Well, this picture is a beautiful portrait of a big breakthrough. It was actually taken by my 9-year-old son, Jack. After talking through this issue for about the thousandth time, he decided to soften his heart and let his little brother play in his room, with whatever his heart desired. They played together, and it was beautiful. He made his little brother’s heart absolutely soar, and I could literally see that his heart was full as well. The two were thick as thieves, playing the morning away — and enjoying it so much that Jack decided to take a picture of it (a mighty fine picture if I may add!). It’s moments like these that make all the hard work worth it. Knowing we can impact a little life for the better, training them up in the way they should go, and seeing them reap the beautiful fruits of our arduous labor – is a feeling that cannot be exceeded by any mundane, materialist, selfish desire we think children may be holding us back from. Parenting, like anything, is all about perspective. Pray for all parents in the midst of the daily grind, that they may place God at the center of it all, and be able to find teaching opportunities, joy, and love in the midst of the chaos.